In mid-August, as racial protests roiled suburban St. Louis, sectarian violence inflamed the Middle East, and Vladimir Putin toyed with the mouse also known as Ukraine, a force of serenity seemed to emanate from South Williamsport, Pennsylvania. A girl stood on a hill of dirt and, with great style and cool poise, threw baseballs to boys at bat. Except this wasn’t just some girl. This was a goddess of bewitching precision, the apotheosis of seizing a moment before a moment seizes you. 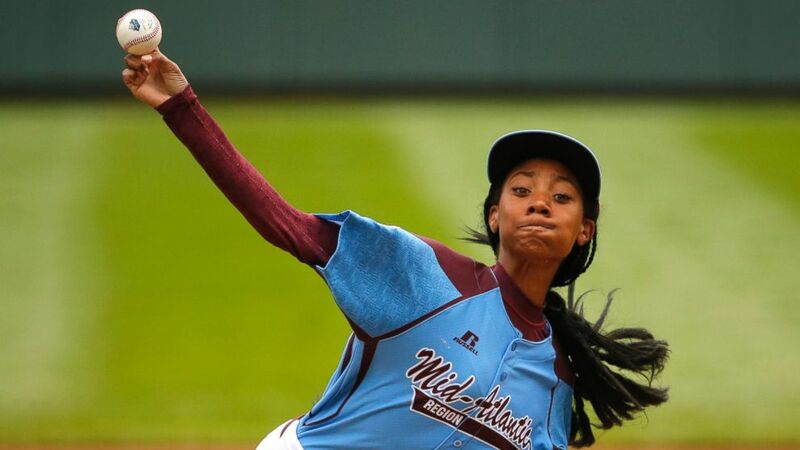 In the two star-making shutouts pitched by Mo’ne Davis at the Little League World Series, 14 batters were sent trudging back to the dugout. I felt for them. No one could touch her fastball. No one could handle her changeup. But most important: Nothing could stop her hair. Baseball players wear two hats: soft and hard. On, off, on, off. That’s no fun for any kind of hair. For pretty hair, it’s hell. Ask Bryce Harper. Davis could’ve worn her braids short with the ends burnt to keep them from splitting, as some women do. She could have secured the hair so that it remained, more or less, in one place when she threw a pitch or swung a bat. That, of course, is not what Davis did. She chose to wear hers in braids that run along the scalp, shielding her natural hair from the transitional grind of the switching. The braids were coarse and relatively loose. It was smart hair. I imagine the looseness saved her scalp from itching, which happens when braiding is as tight and as fine as, say, the iconic hair of the former Essence magazine editor Susan L. Taylor. Davis wore her hair long. It fell below her back, the tail unbraided. When she was at rest, the hair was like Rapunzel’s. In motion, it was pure style: glamorous and hypnotic. When Davis was in motion, so was the hair. Tempered, yes, but never tamed. It’s possible that the hair’s motion — part whip, part whirlpool; some combination of violence, beauty, and grace — seduced constituencies predisposed to understand the story of that hair. It invoked Valkyries, graphic novels, and photo shoots. Her hair effortlessly did what certain pop stars need industrial-strength wind-generating fans to do. By itself, the hair would give you pause. As worn by Davis, it conferred upon her unself-conscious strength, majesty, otherworldliness. That’s how she seemed to throw: with abandon. Davis’s entire demeanor was as cool as light eyes. She spoke to the press with humor that made Andy Roddick seem like Bill Belichick. For more than a week in the middle of August, she was a star, naturally and fully formed. Her team, Philadelphia’s Taney Dragons, didn’t make it to the championship game. After the season, Davis made the media rounds, dancing with Steve Harvey and Jimmy Fallon, throwing the first pitch at major league games. The braids were gone, her hair cut and straightened. She looked less like a warrior and more like a teenage girl. But she still carried with her the looseness that the long hair seemed to unleash. Watching her was my summer vacation. I had felt the same sense of relief and release at the beginning of the summer, reaching the end of Orange Is the New Black. The second season featured two of the horniest lesbians, Nicky (Natasha Lyonne) and Big Boo (Lea DeLaria), having a contest to see who could, well, amass the most conquests. It introduced a villain — a neighborhood drug pusher named Vee (Lorraine Toussaint) — who consolidated the black inmates in order to dominate them. For much of the season, I had feared that the show had gone from great to good. There was a stretch when the writing around this galaxy of women had begun to feel diagrammatic. But the miracle of this show is that it knows what it is and where it’s going. The diagram became a treasure map. I tabled my doubt and let the map lead me. By the last episode, we had all arrived — the writing, the characters, the show, myself. And where we arrived was a glorious last sequence that rested upon the bald head of Rosa (Barbara Rosenblat), who’d been regularly driven from prison to a hospital for chemotherapy. Rosa was a big, stern lady, seemingly immune to gratuitous displays of feeling, but she makes a little buddy in the cancer ward and the sun comes out (a bit) on her cold-looking face. The episodes reach a perfect climax. The rightings of the wrongs all seem to unfurl at once, a bunch of flowers blooming together because it’s spring. When Rosa rediscovers her old outlaw self and drives off, plowing into someone very special along the way, I practically shot tears at my television. Here was a drama presented first as farce and then as transcendence. I laughed and cried in awe, overwhelmed by irony. The camera stays with the big bald head of Rosa, deathly ill, and with her look of exhilaration. It broke my heart. It made me cheer. It turns out that the hole OITNB had seemed to dig for itself was there so that the show could plant more seeds. It’s part of the show’s perverse brilliance that some of these women seem to need prison to feel this free. In July, I was at the home of some friends. There were panoramic views, some alcohol, and a tiny Bluetooth speaker emitting a Spotify playlist made by one of the hosts, a compilation of his favorite summer jams, including the one that makes me feel most invincible. I’d heard the song half a dozen times, and every time, two false sensations overwhelmed me. The first involved the belief that I could fly. The other was the belief that I was hearing the best song Rihanna had ever recorded. It has a gritty chorus sung in a low, growling cadence, and a pre-chorus rented from the rapper Kendrick Lamar. “One, two, three / One, two, three: Drink,” she sings twice before the plane of her voice leaves the runway and takes flight over Vice City. Each successive syllable in the featured word — “chandelier” — reaches a higher altitude. Ten thousand feet. Twenty-five thousand. Forty thousand — ding: The captain has turned off the “fasten seat belt” sign. Rihanna, I thought while moving about the cabin, is going to clean up at the American Music Awards and the Billboard Awards and at the Grammys because she’s almost never had a finer hour as both a singer and an interpreter of song. Except that every time I found myself levitating over the planet, I suddenly remembered that Rihanna hadn’t made this song. The woman with the Dreamliner voice was a 38-year-old Australian named Sia Furler, who records under only her first name. This is a long way of saying that every time I encounter this song — which, for the record, is called “Chandelier,” and goes, “Iiiii’m gonna swiiiing / From the chandelier / From the chandeleeeEEEEEERRRRRR” — I think I’m hearing a black woman from Barbados, when, in actuality, I’m hearing a white lady from Adelaide. Maybe this also happens to you. As it happens, Furler has written hits for Rihanna (as well as for and with almost any current pop star you can name). She’s also been recording for almost two decades, first as part of a regrettable acid jazz outfit, then as a solo artist whose biggest song was a rocking slice of dance-and-B called “Clap Your Hands.” Her singing back then had heft and black twang. It had seriousness. But it couldn’t have been truly mistaken for a black artist. It read as “pop,” and even with the edge in Furler’s voice, “Clap Your Hands” had pep. Her singing on “Chandelier” and on much of her fourth album, 1000 Forms of Fear, is bigger, with an ever-sharper edge and more pointed black inflection. She doesn’t say “drink” in the pre-chorus. It’s “drank,” the way it is when, say, Beyoncé says, “I been drinking,” at the start of “Drunk in Love,” or when Lamar says it as a flashback imperative in “Swimming Pools.” Furler sings it how Rihanna would. Conveniently, Furler’s stage aversion tips into performance art. Of late, she has vowed not to perform live facing the audience. She’s spent photo shoots sitting with a decorated paper bag over her head. The video for “Chandelier” stars Maddie Ziegler, then a skin-pimplingly talented 11-year-old from the Lifetime reality show Dance Moms, doing interpretive dance on behalf of Sia’s id. In a short blonde wig, Ziegler makes her way across an apartment, spinning, stuttering, aloft. It’s the glorious physical equivalent of Furler’s staggering singing. If Furler is forced to take the stage (at the Grammys, say), she has decided to do so only with her back to the audience. She’s the opposite of Mo’ne Davis in that way. The official explanation is personal. Years ago, Furler found celebrity, even as a minor pop star, impossible to cope with. She took too many pills and drank too much alcohol. Returning to that place — being seen — doesn’t interest her. Fame is hazardous to her health. It constrains her. So she retains her anonymity in order to sing without restraint. These three — Davis, Rosa, and Furler — have that in common: the obliteration of limits. To watch Davis throw a baseball, see Rosa drive the bejesus out of that van, or experience Furler’s voice-body collaboration with Ziegler is to see an obstacle mowed down. This year, those three women’s will became contagious. If they couldn’t be stopped, how could you?